Hear from past published authors…. hopefully their experiences encourage you all to submit your papers!! Research Interest: Japanese nationalism and identity formation, Shintō studies, and state-society relations in Japan. What was the title of your published paper and what class was it written for? The title of my published paper was “China’s Balancing Act: Examining China-DPRK Relations in an Era of Political Uncertainty” and was originally submitted as a term paper for POL S 445: Topics in Globalization in Governance (Chinese Foreign Policy) in Fall 2017. I originally heard about the opportunity to have papers published in the PSUR from the PSUA website. It’s a rare opportunity for undergraduate students to have the opportunity to experience the peer-review process before graduate school, so I immediately jumped at the opportunity. As it is my intention to pursue graduate studies after my degree, I wanted to gain experience going through the process of peer-review and publication. The feedback I received on my writing was fantastic. Favourite political science class as of yet? Without a doubt my favourite political science class has been POL S 475: Politics of Japan and China with Ashley Esarey. Few courses pushed me to think as critically and develop my writing skills as much as this class did. Any extracurricular activities/travel/work experience that shaped your UofA experience? I had the opportunity to travel to Japan for the past two summers of my degree, and it was a fantastic experience. When your research interest is region-based, nothing can compare to the context you can get by seeing it in person. These trips allowed me to supplement my existing research projects on Japan with further context, but also let me further develop my language skills. If you have the opportunity to travel during or after your degree, I absolutely recommend it. How have you used/learned from the publication process? The publication and peer review process has provided me with some of the best feedback I have ever received on my written work. The type of comments you get while going through the process goes above and beyond what you get in a classroom environment. Because several people are reading your work, the comments you get back really push you to improve your writing ability. The skills I learned as part of this process have further equipped me with the necessary skills to create my graduate school applications. What is the post valuable aspect of your political science degree? The biggest advantage of a political science degree is its flexibility. This degree has taught me to think critically and to read carefully, to write skillfully and to challenge existing assumptions. These are skills that are useful in all lines of work, and not just academia. Because of the numerous areas of study within the political science department, I have had the freedom to choose a specific research interest to apply these skills to, which has really opened up the door for so many more opportunities. 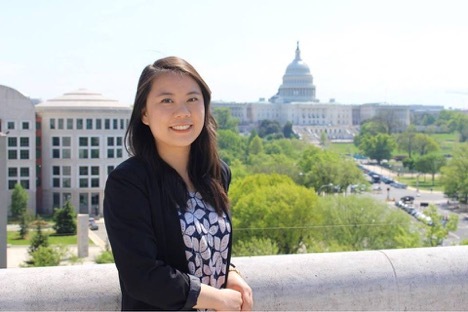 Sylvia Wong, U of A graduate, working in government but hoping to take the LSAT next year. The name of my published paper was Canada’s Urban Indigenous Populations: Comparing Policy Learning in Winnipeg and Edmonton for Jim Lightbody's 400 level Metropolitan Government class (POL 435) . Why did you decided to submit your paper? Not only does it look good on your resume to include a peer-reviewed and published paper, but you are also able to practice your writing skills and go through the process of having your paper read by someone other than your professor. Not to mention, it feels great to see your hard work shared with fellow classmates, and not just used to get a grade for class! Either Dr. Jared Wesley's "Topics in Canadian Politics" class (POL 421) or his "Topics in Canadian Public Policy: Intergovernmental Relations in Canada" class (POL 440)! Both were highly engaging and interactive, which not only takes you out of a traditional classroom setting, but also gives you lots of opportunities to contribute and discuss with your classmates. These classes also taught me important skills such as writing a briefing note, research, negotiating, and public speaking that I now use at my job. A highlight of my undergraduate career was definitely my internship at the Canadian Embassy in Washington, D.C. It was such an eye-opening experience working in a foreign country, and I fell in love with the city. I got to see the inner workings of international relations first hand, and the different experiences I had, whether it was handing out pamphlets on Capitol Hill or listening in on a think-tank discussion, made me appreciate the importance of politics even more. Other highlights include Inauguration Day (the food at the embassy was certainly a bigger highlight than Trump), and meeting Prime Minister Justin Trudeau! What is the most valuable aspect of your political science degree? Obtaining research, writing, and analytical thinking skills. Learning how to write clearly and concisely is so important, especially when your job depends on it. While my other major in English certainly helped hone my skills in this department, political science classes forced me to close-read and do analytical thinking! University of Alberta Political Science Undergraduate Association 2018-19. For any external media requests, please contact psua.communications@gmail.com.